We are delighted to announce that, whilst we didn't win (that accolade went to Penshurst), we have been awarded a "Highly Commended" certificate in the 2015 Kent Food Awards, Farmers Market Category. We were secretly nominated (fantastic, thank you, whoever you are!) and then judged to be worthy of a space in the final three! Tough competition indeed, as the foodie scene in Kent is at its liveliest for years and we are absolutely thrilled to be recognised in this way! 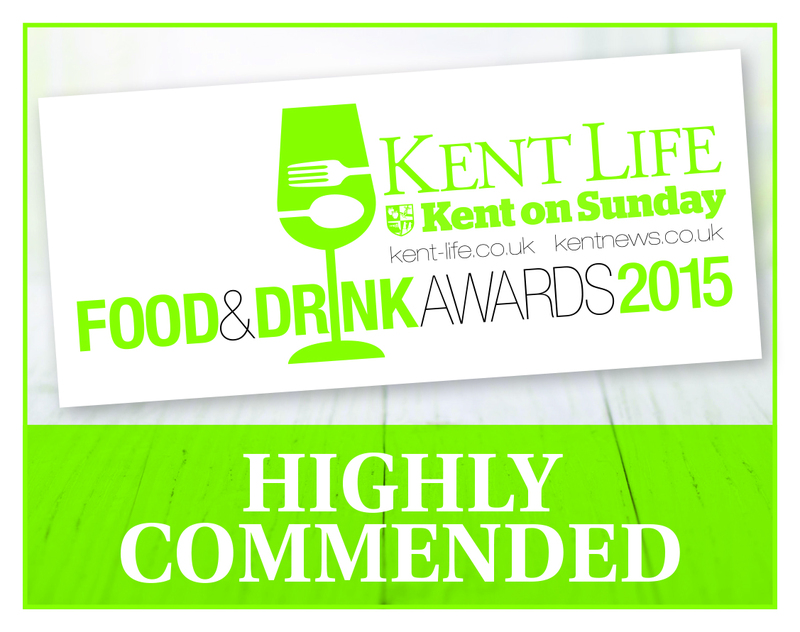 The shortlisted finalists for the 2015 Kent Life and Kent on Sunday Food & Drink Awards were Penshurst, Tonbridge and ourselves. The awards dinner took place at Ashford International Hotel on Thursday 15 October 2015 when we were presented with our certificate. The prestigious awards, which launched in 2013, are designed to champion, highlight and offer a showcase to the good and the great from the region’s food and drink industry, including local producers and suppliers, small farming businesses, chefs, restaurants, pubs and hoteliers. All the finalists will be people who care about the countryside and the future of our local environment. In our category, the criteria are quite clear - "The key to a good Farmers’ Market is not only the range of produce and the quality of its stalls but also the principles that it supports – for example, does it work as a co-operative with other farmers? Is most of the produce sold there grown or raised locally? Are the stallholders welcoming and knowledgeable? Is the layout easy to navigate as you move around the market? Is the Market well advertised so you can plan your visit in advance and is there good accessibility and parking?" Kent Life "How does it feel to be nominated?" Anne "We’re always overwhelmed at the support our regular visitors give us. Come rain or shine, they’re there and the fact that someone has gone to the trouble of nominating us for such a prestigious award is both unexpected and extremely gratifying. But then, having said that, the visitors are such lovely people. We always look forward to greeting the families and couples, friends young and old as they come and go – especially the children, the next generation to grow up appreciating how good local food really is." Kent Life "Why do you think the readers have voted for you?" Sally "My Mum, Anne, & I have only in the last two years taken over the management of the Knockholt Market at the request of the site owners, Coolings Nurseries. For five years, we’ve run very popular craft shows there and the Coolings team felt that our experience in organising those events should be transferable to the Farmers Market. How wrong could we all be! We’ve worked really hard to learn about the local food scene and gather together such a fine team of producers. The popularity of the market now is more testament to the stallholder's hard work and eye for quality, than it is to ours. As market managers, its our job to concentrate our efforts into spreading the word to the wider community about the amazing atmosphere and produce on show at our market – without the visitors, none of the growers would be able to continue.